As more hearing and deaf people learn sign language, the range of careers open to that skill has broadened. In fact, the U.S. Bureau of Labor Statistics says a career as an interpreter is growing much faster than average, with 17 percent growth predicted through 2026. In addition to traditional careers like interpreting, new career possibilities open up as technology evolves. Fluency in ASL is also needed for specialized careers in education, health, therapy, and recreational services. What Is American Sign Language (ASL)? American Sign Language is a complete and complex language consisting of hand movements, facial expressions, and posturing. American Sign Language is one of several communication options available to people who are either deaf or have hearing problems. It has its own grammar and syntax that is distinct from English. ASL programs report that most of their graduates are hired by schools, community colleges, and four-year colleges. In education, there is always a need for people who know sign language. Careers include being a sign language interpreter for individuals, groups, meetings, and classes in an educational facility. ASL-fluent teachers are needed as teachers at deaf schools, special education teachers, and college professors at Gallaudet University, National Technical Institute for the Deaf (NTID), and other deaf programs within colleges. Another education-related career is working with deafblind students using a tactile form of sign language. Sign language teachers can be found at colleges teaching classes, giving private lessons, or leading baby sign language classes. Sign language teachers can work in interpreter training programs. Medical professionals who know sign language are in demand. Speech-language pathologists, audiologists, and occupational therapists who know sign language can work better with their clients. Social workers who know sign language are also needed. 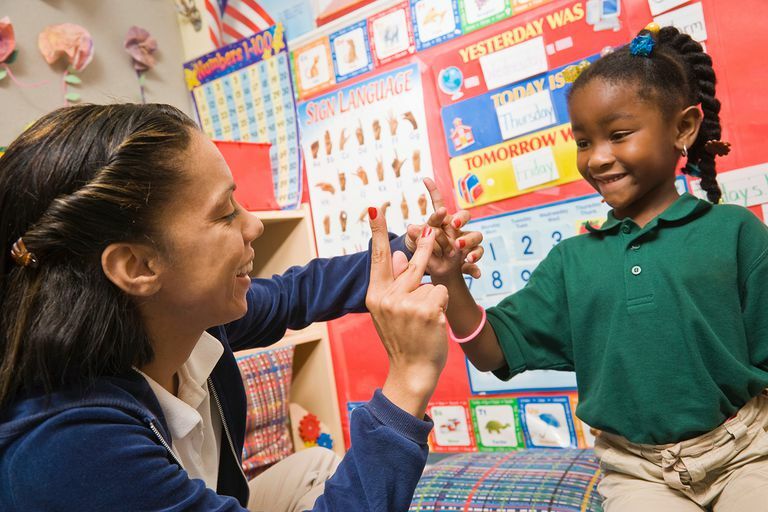 Psychologists who know sign language are employed at schools for the deaf and colleges as counselors, and can also work for private and government mental health service providers. ASL interpreters who are skilled in medical terminology are needed by health care facilities to communicate with patients and their families. They may need an advanced national certification to practice in some healthcare settings. They may be employed by the facility or work in healthcare facilities as independent contractors or for an interpreting service. Federal, state, and local government agencies offer opportunities to people skilled in sign language. Such people can be found in equal opportunity offices, or working as deaf and hard of hearing specialists at vocational rehabilitation agencies and state commissions for the deaf and hard of hearing. They also work in law enforcement, judicial, and detention environments. Police officers who are skilled in ASL are needed. Interpreters can be found in multiple environments. Interpreters are in government agencies, courtrooms, hospitals, schools, museums, amusement parks, theaters, and more. Deaf people can also work as deaf interpreters for deaf people with special needs. Community interpreters may be self-employed or work for an interpreting service and provide their services in a variety of environments. Or, they may be employed by organizations that need their services on a continuous basis. One example of an interpreting-related career that has evolved is managing sign language video relay services, and video remote interpreting services. Deaf people can manage these relay services, so this career is not limited to hearing sign language interpreters. Travel agents and tour guides that know sign language can be found working in specialized deaf programs at travel and tour agencies or even running their own agencies. Occupational Outlook Handbook, Interpreters, and Translators. Bureau of Labor Statistics, U.S. Department of Labor. https://www.bls.gov/ooh/media-and-communication/interpreters-and-translators.htm. How Hard Is It to Learn Sign Language?